The other day we learned of a new electric motorcycle racing series that will be run under the AHRMA umbrella. There's actually a fair bit of history of AHRMA hosting electric motorcycle racing, and I thought it might be worth recounting that history. 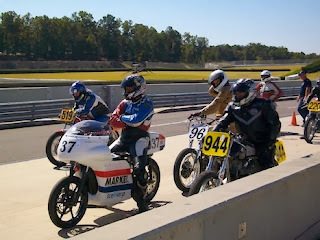 First, AHRMA is the American Historic Racing Motorcycle Association. In practice most of their bikes are loud 2 stroke machines from decades ago, that AHRMA members lovingly keep in a restored condition, racing them at AHRMA events. They hold events across the country, but as a club racing series those events are not well attended. Instead, it's the racers, their friends and family. 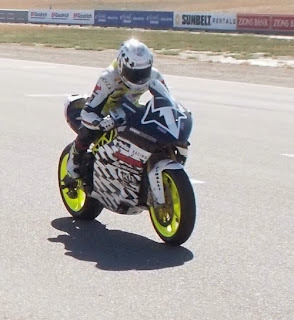 The first instance I know of where an electric motorcycle raced at an AHRMA event came in October 2010. Team Electra, the brain-child of Brian Richardson, had raced in the 2010 and 2011 TTXGP seasons with a Norton Featherbed motorcycle from the 1950's that had been converted to electric. At the end of the 2010 season, the team had a chance to go to Barber Motorsports Park in Birmingham Alabama for an AHRMA event. That was the first known instance of an electric motorcycle entering a gas motorcycle race, competing for points, and winning. AHRMA then hosted the TTXGP North American finals events for the 2011 and 2012 seasons. That occurred both years at Miller Motorsports Park outside of Salt Lake City. The 2011 TTXGP final featured one of the more interesting line-ups in electric motorcycle racing history, so far. It came a little over a month following the 2011 TTXGP/e-Power race at Laguna Seca during which Mission Motors beat the pants off both MotoCzysz and Lightning Motorcycles, setting a lap speed record that still stands today. The line-up at Miller featured MotoCzysz, Lightning, Brammo, Team Electra, and Proto Moto (Ely Schless). MotoCzysz won the race, beating Lightning by 30 seconds. The 2012 TTXGP final (and this) had a rather different line-up, featuring Brammo, Virginia Tech, and several bikes from Zero Motorcycles. By this time Eric Bostrom had joined the Brammo line-up and had raced with them in a couple events. The 2012 season was the first year in which Zero Motorcycle's bikes were credible enough for racing in the TTXGP. They'd raced all year with a fleet of four bikes and an ever-changing roster of riders. The 2012 season was a turning point in electric motorcycle racing, because the field to be dominated by Brammo, with prototype high-end bikes, and Zero Motorcycles, with manufactured bikes close to 250cc performance levels. In 2010 and 2012 the field was dominated by prototype bikes or home-built conversions. With the 2012 season, factory prototypes and manufactured bikes became the norm. The 2012 TTXGP World Final, held during the AHRMA weekend at Daytona International Speedway, featured the same line-up as the North American final (Brammo, Virginia Tech, and Zero Motorcycles) plus Catavolt came all the way from Australia to race. The most amazing part of that event was the performance of the two Brammo bikes. Eric Bostrom and team-mate Steve Atlas both were hitting 170 miles/hr in race conditions. Just two years previously, Lightning Motorcycles had set the electric motorcycle land speed record at 176 miles/hr (which they surpassed with a 215 miles/hr record in 2011). But there they were, on a race track, rather than a straight line track like is used in land speed racing, hitting nearly the same speed, in race conditions. This event turned out to be Steve Atlas' last time racing with Brammo. For the 2013 season, the TTXGP no longer existed, and the new series, eRoadRacing World Cup, had to operate under different conditions. Namely, they could only hold races at FIM homologated race tracks, resulting in only four events this year all of which came during MotoGP weekends. That meant no AHRMA/TTXGP events in 2013. What all this means is that AHRMA is already familiar with the electric motorcycle scene. They know who we are, and how to deal with us. Because AHRMA events are quiet little affairs, we'll be missing out on something the TTXGP originally sought -- exposure before large audiences. The TTXGP's first event, 2009 at the Isle of Man, was on one of the largest stages one could imagine, TT Week. During the 2010 season the TTXGP was able to race at AMA events, in front of large audiences. But something happened beginning with the 2011 season, and TTXGP was no longer able to race at AMA events and instead ended up at less attended club racing events. By working with the AHRMA this new series won't be in front of large audiences. But maybe the sport is too young for what the large audience events demand. They're expecting 600cc superbike or MotoGP speeds, and the number of electric motorcycles that can hit such speeds are, well, extremely rare. Namely, MotoCzysz's two bikes, the Mission Motors 2011 bike, Lightning's two bikes, Brammo's two bikes, and maybe bikes from Meunch or Zongshen. Everyone else has speeds closer to the 250cc-450cc classes. The other requirement for large audience events is enough awareness that fans will pay for tickets to see them race. Do enough people know about electric motorcycle racing to form a large enough fan base? I don't think so. 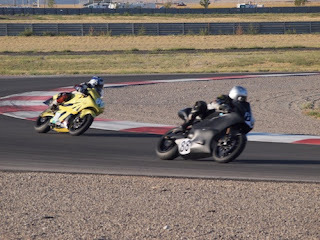 I suspect that racing at AHRMA events could give the electric motorcycle racing sport time to mature a bit before trying again to break into the big time. Except that the eRoadRacing organization will presumably make another go of a racing season in 2014. What will eRoadRacing's plans be? And how will it overlap with this new series? Will the new series even be able to get off the ground? Lots of questions remain.